Thank you for visiting the Florida Highway Patrol, Troop A, Home Page. The ten counties of Troop A, comprise the northern and most western portion of our state stretching from Panama City to Pensacola. The troop has approximately 150 sworn and non-sworn personnel assigned to two districts, Panama City and Pensacola. This group of dedicated men and women work hard to ensure the safety of those who live in the Florida Panhandle and those who visit our beautiful parks, resorts and beaches. It is our sincere desire to promote highway safety through education and the enforcement of Florida’s traffic laws. You will find useful links to local government, attractions and other resources on the Troop A, Home Page. If you are interested in a career with the Florida Highway Patrol contact our Troop A Recruiter. Should you need information or would like to schedule a safety education talk contact our Office of Public Affairs. Enjoy your internet visit of Troop A, home of “The World’s Most Beautiful Beaches”. Welcome to beautiful Panama City. The district boundary includes six counties: Bay, Calhoun, Gulf, Holmes, Jackson and Washington. Panama City is home to some of the world’s most gorgeous beaches and accommodates thousands of visitors year round. Many college students choose Panama City Beach as their destination of choice for Spring Break. Make the Panama City District your next vacation choice and discover it for yourself. The Pensacola District is comprised of Escambia, Okaloosa, Santa Rosa and Walton counties. It is home to the “Cradle of Naval Aviation”, Naval Air Station Pensacola. The National Museum of Naval Aviation, an international attraction is located on NAS Pensacola and ranks as one of Florida’s most popular. In addition the Navy flight demonstration team “The Blue Angels” call Pensacola home. Complimenting NAS Pensacola is NAS Whiting Field located in neighboring Santa Rosa County. Other military installations also located in the district include Hurlburt Field, Duke Field, with Eglin Air Force Base being the largest land-area Air Force base in the world. The district’s northern area offers an assortment of unspoiled landscape from rich farm land, pine forests, rivers and parks. The southern area of the district is a vacation paradise with miles of famous sugar white beaches along the crystal clear emerald waters of the Gulf of Mexico. World class resorts, excellent shopping, dining and plenty of activities for the sports enthusiast are found in the two counties. The greater Pensacola area is one of the earliest settlements established in the new world briefly inhabited by the Spaniards in 1559 and permanently settled by the Spanish in 1698. In 1719 the French occupied the territory until 1722 when it returned to Spanish control before being passed to the British in 1763. In 1814 the United States captured the territory from the British and returned it to the Spanish. In 1818 the territory was seized from the Spanish and formally entered into the union with the rest of Florida in 1821. Truly a “City of Five Flags”, this area of Florida is as diverse a population as any in the United States. From the Gulf of Mexico beaches to the hardwood and pine forests, the Pensacola District has something for everyone. Whether you are a first-time visitor to our beautiful beaches and historic towns or a “regular”, your visit to our area will be one of the best you’ve taken – and one you will want to repeat! The Pensacola District personnel are dedicated to “Courtesy, Service and Protection”. The Troop A Office of Public Affairs is responsible for providing information to the public, responding to inquiries from the statewide news media, conducting traffic safety programs, and managing various highway safety programs. 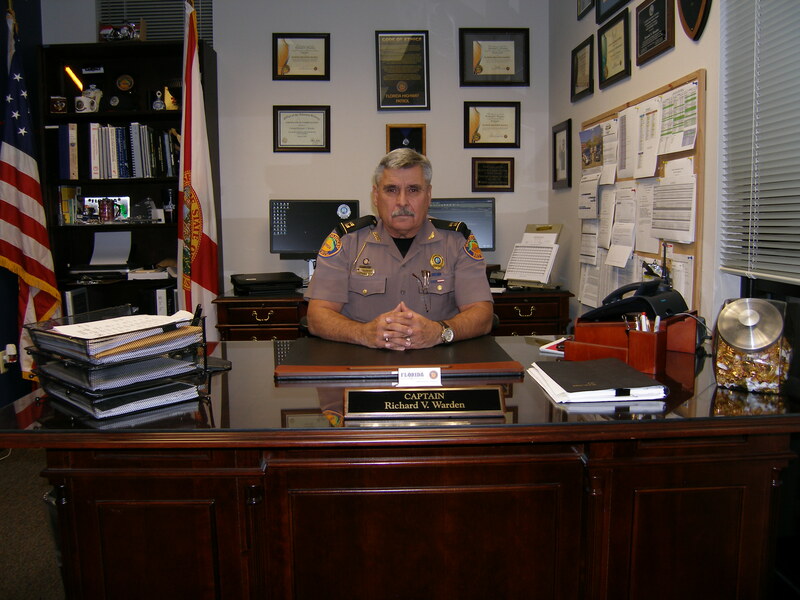 Request for traffic safety program presentations can be made by contacting Lt. Eddie Elmore at EddieElmore@flhsmv.gov.